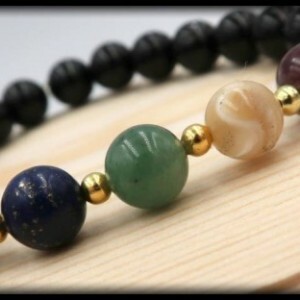 Harmonize the mind, body and spirit, with this custom made masculine bracelet. Designed to disperse emotional pain, attract love, stimulate concentration, focus and enhance memory. 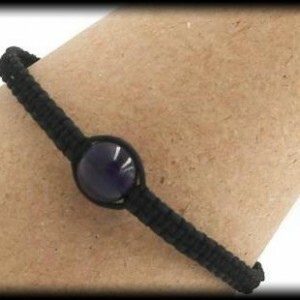 This bracelet also helps to lift bad moods. Tiger's Eye aids with balancing emotional energy, along with alleviating depression, assisting in resolving dilemmas and internal conflicts. The Pink Tourmaline works as an aphrodisiac to increase passion and inspires one to have trust in love. The Hematite stone is an essential piece, restoring, strengthening, and regulating the blood supply, while boosting self-esteem. Included are 2 Buddha charm pieces to help one gain a better understanding of life in the deepest way possible. This powerful wrist wear is constructed with 8mm beads of Pink Tourmaline, Hematite, and Tiger's Eye. SIZING INFORMATION Please measure your wrist with a measuring tape to ensure the most accurate measurement. If you do not have a measuring tape, you can also use a string by wrapping it around your wrist and then cutting the piece of string. After you have your cut string, place it alongside a ruler and write down your measurement. To ensure a perfect fit, please had 0.5 inch to your wrist measurement, if you want a little room please add .75 inches to your wrist measurement.